JUL26 1538EST. Shares of ONEOK, Inc. (OKE) are not usually tracked by intraday traders, mostly as their average volume is relatively light (1.6M per day over the past 3 months). Yesterday, however, OKE gapped higher on news of a divestiture and, from the first minutes of trade, the pace of volume was several times (5x-10x) higher than the daily average. Even with a nearly 15% gap up, the first 5-minute high was surpassed before 9:40am, suggesting the potential for further upside. 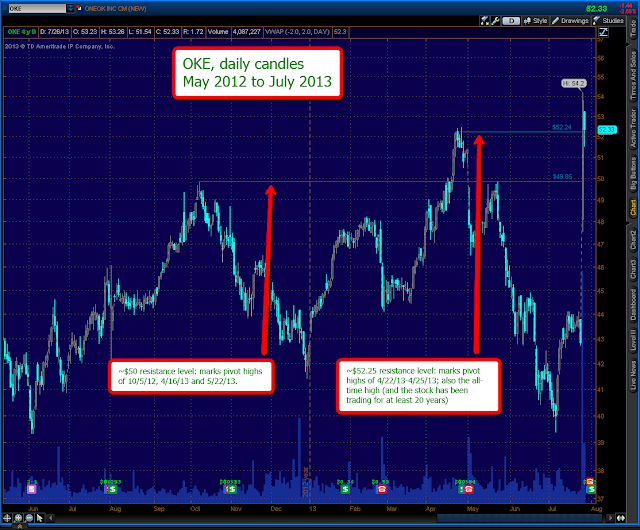 OKE (ONEOK, Inc). May 2012 to July 2013. Daily candles. Looking at the daily candles chart above, two resistance levels are clear: ~$50 and ~$52.25. The former was formed by three pivot highs over the past year, while the latter marks the all-time high (and the stock is no recent IPO; it's been trading for at least 20 years). 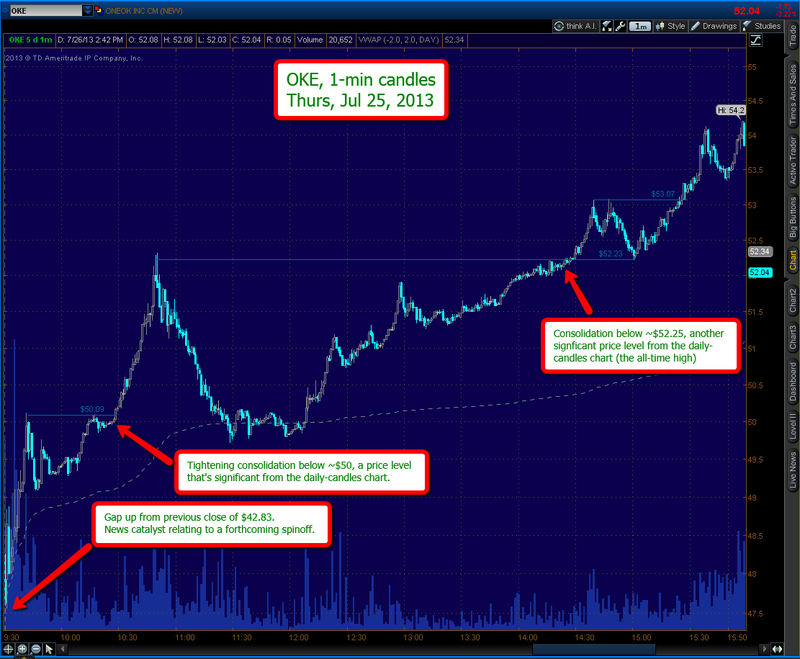 OKE (ONEOK, Inc). Jul 25, 2013. 1-minute candles. And examining the intraday chart, the discerning observer can see that OKE respected these long-term resistance levels with almost surgical precision. On the first approach of price to either $50 or $52.25, a short position would have yielded quick profits. And on the break of either level, a long position would have likewise been profitable and, going with the day's trend, relatively easy to initiate. Oftentimes, trades around long-term support or resistance levels are not quite this easy due to the incidence of false breakouts. Not so in the quite okay trades on Jul 25 in OKE. JUL16 2206EST. Shares of the Icarus-emulating Tesla took a dramatic tumble today, with price declining steadily throughout the day, then showing what appeared like a selling climax in the early afternoon, and finally heading lower still. 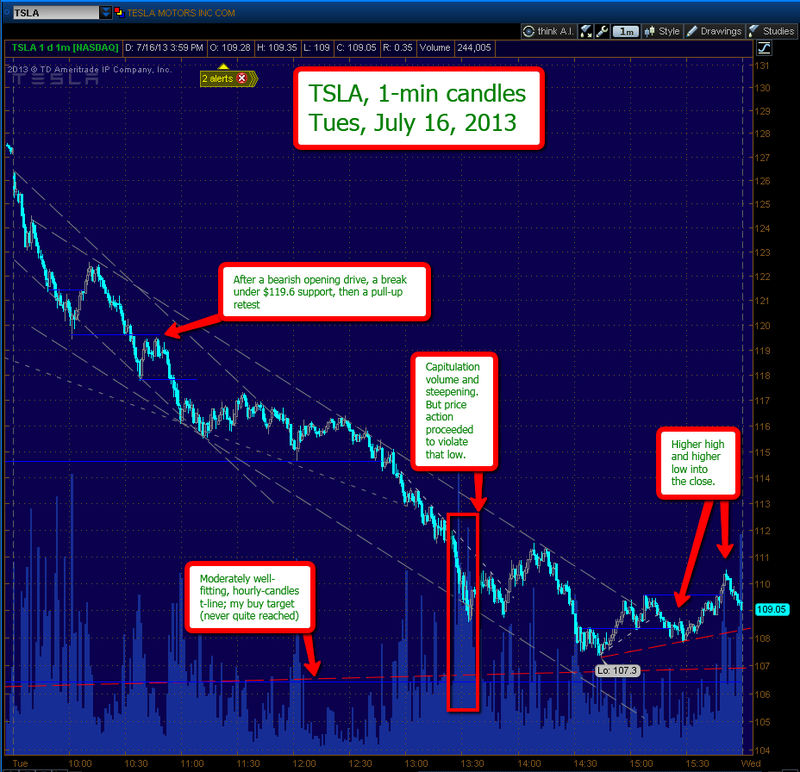 The one-minute candles chart is below. 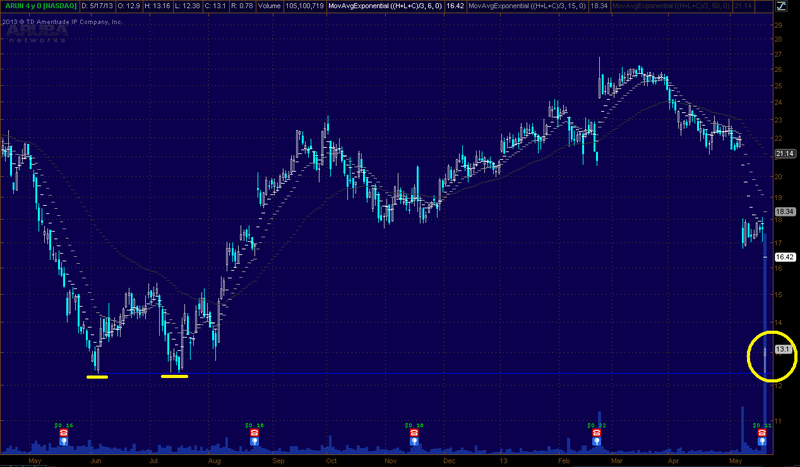 $119.6 was a notable morning support level which, when breached, provided a sound short-sale opportunity. The same could be said of $117.8. Next up, $114.8 was a strong support/resistance level from several weeks back (marking the May high, as well as consolidation support on July 3), but it only held today for the lunch hour. TSLA (Tesla Motors). Jul 16, 2013. 1-minute candles. Capitulatory selling occurred around 13:30, evidenced by a steepening of price descent and by the heavy volume (the highest of the day, all the more notable as it occurred during the normally sleepy midday). Yet this climax did not deliver price to the relatively well-defined, hourly-candles trendline, which is currently around $107; as such, bulls were reluctant to commit capital, and the sell-off headed lower. 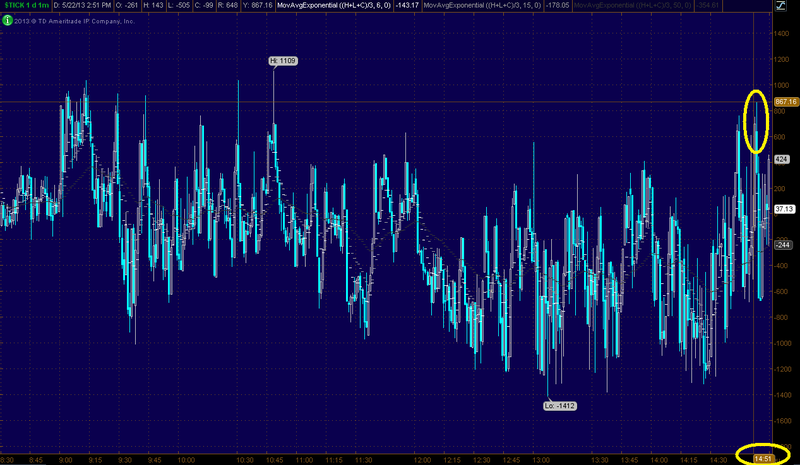 In the last 90 minutes of the day, price action changed somewhat. Bulls were able to engineer a higher high and a higher low, which marks the tentative beginning of a new uptrend (but, of course, there is no guarantee that it will last). MAY22 2249EST. Although posting on these pages over the past several weeks has been slower than even US GDP growth, today's Wall Street volatility has shamed the author back onto the hamster wheel. And yet while today's big-picture trading was dramatic, with a peak-to-trough distance on the S&P500 futures contract (/ESM3, the June 2013 contract) of 39.25 points (the greatest since April 15th), this post will briefly examine a specific trade setup that appeared in the late afternoon. 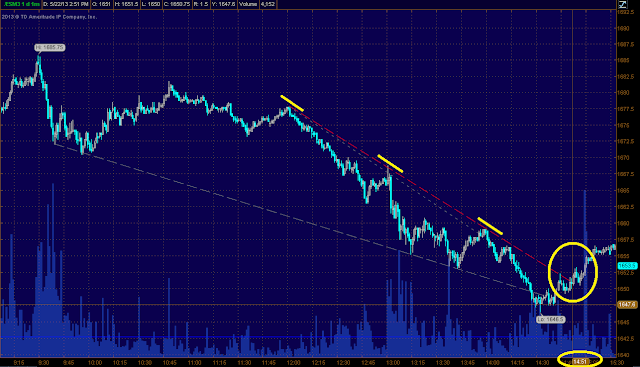 At 2:51p CST, S&P500 futures broke through a three-hour descending trendline, shown below in dashed red. The trendline is defined by the three local price extremes indicated by a solid yellow line, which occurred at 12:00N, 1:00p, and 2:00p (interestingly, right at the top of the hour in each case). Such a break of trendline has the potential to be short-term bullish, particularly if confirmed by bullish action in the NYSE Tick, a very short-term indicator of market sentiment. ESM3 (E-mini S&P500 futures contract, June 2013 expiration). 9:00a CST to 3:30p CST on May 22, 2013. 1-min candles. 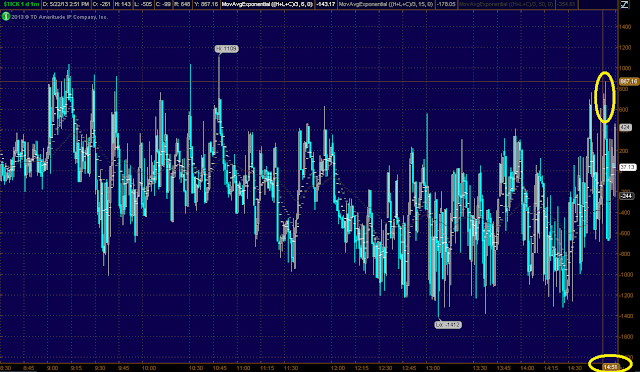 NYSE Tick. 8:30a CST to 3:00p CST on May 22, 2013. 1-min candles. 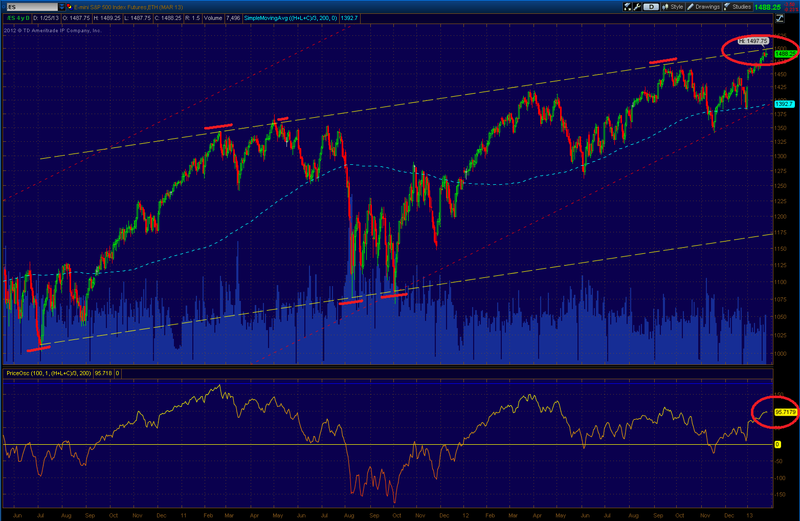 The aim here is not to delve into the specifics of various NYSE Tick levels or to discuss trendline breakouts in depth. Rather, the example illustrates that market opportunity is available on a nearly continuous basis, often in a counter-intuitive direction -- after all, the long trade in this example occurred deep into a 2.5% sell-off from midday highs. MAY17 1633EST. Aruba Networks (ARUN) today rewarded traders willing to execute a simple trade idea: that after a savage, 29 percent overnight drop on a badly-received earnings report, the security would bounce from well-defined, 1-year horizontal support at $12.36. ARUN (Aruba Networks). Apr 17, 2012 to May 17, 2013. Daily candles. To be sure, it's often imprudent to take the "catch a falling knife" trade, or put another colorful way, to "stand in front of a speeding bus." But, on the other hand, well-defined horizontal support or resistance can often present a compelling risk-reward proposition. If a trader buys just above the support level, downside is limited (assuming the trader is willing to immediately cut losses on a violation of the support level) while upside is potentially considerably larger. APR23 2010EST. Shares of Apple (AAPL) whipsawed in after-hours trade today on the release of its quarterly earnings report. As trading resumed at 15:50 CST after a 26 minute halt in the action (during which the company's numbers hit the wires), the stock roared higher and briefly consolidated between $420 and $426. 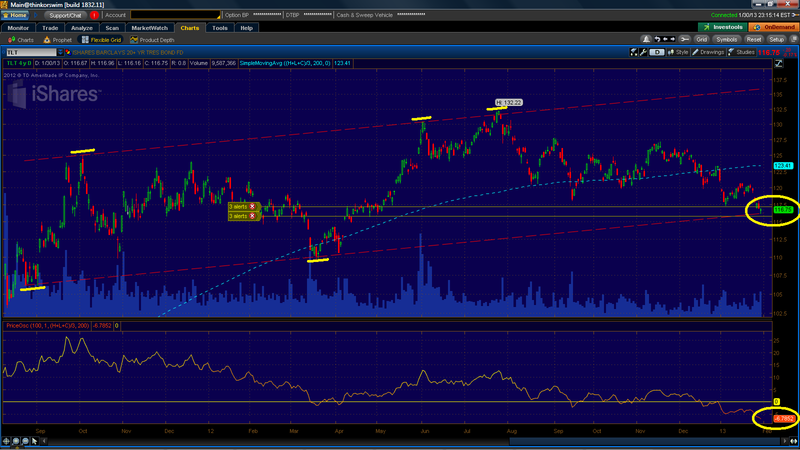 AAPL (Apple). 15:00 CST to 18:45 CST on Apr 23, 2013. 1-minute candles. With the conference call just underway at 16:02 EST, the iPhone maker touched a high of $429.9. But then, shares began to languish and at 16:28 retraced to the $420 consolidation low of a half hour earlier (circled in yellow above). That consolidation support held for a mere 2 minutes however, and shares proceeded to accelerate to the downside, ultimately retracing all $27 of the after-hours' pop. 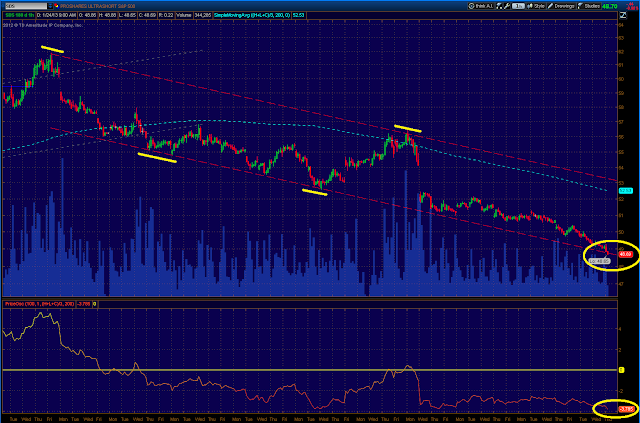 AAPL ultimately stabilized at the $402 horizontal support level from the 15:00 CST hour (circled in red above). APR16 0846EST. As everyone knows, gold futures (along with silver and crude oil, among other) have experienced a savage decline since Friday, Apr 12. Over the past three trading days, the yellow metal has declined from a high of around $1560 to an overnight low last night of $1321.50, a decline of just over 15 percent. 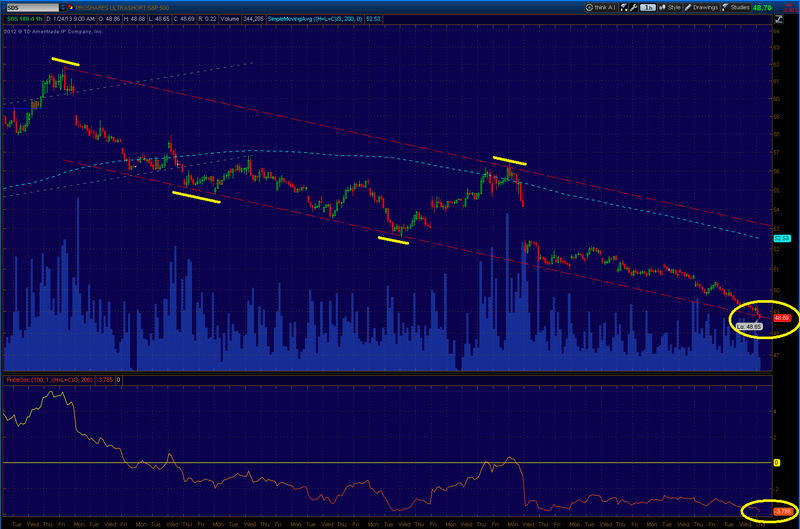 GCM3 (Gold futures contract, June 2013 expiration). Fri, Apr 12, 2013 to Tues, Apr 16, 2013. 5-min candles. Among the interesting stories to tell about this price decline is its remarkably close adherence to a simple price channel, shown above with grey dashed lines. Almost to the tick, the channel's upper boundary connects three prominent local maxima and, with its parallel lower boundary, perfectly connects two local minima. Meanwhile, the other local minima of the decline all stop just above the channel's lower boundary. Why does this matter? For one, consider the channel as a simple model of the extremes of market participants' collective psychology. As price approached each of the local minima, a frightening chaos was breaking out: price decline, already very severe, was accelerating further; terrified longs were reaching their maximum pain point, often in the face of margin calls and even complete account blow-ups; jubilant shorts were jumping in with ever more enthusiasm. Yet in the face of all this momemtum, all this money, all these hormones, price action at 9:55a CST on Monday, Apr 15 stopped at $1356.6 -- the lower boundary of the channel that had been created over the prior 24 tumultuous hours. Moreover, consider how the channel was further validated once price action became poised to break through the upper boundary, which occurred around 22:00 CST on Monday, Apr 15 and, in the screenshot above, is circled in yellow. 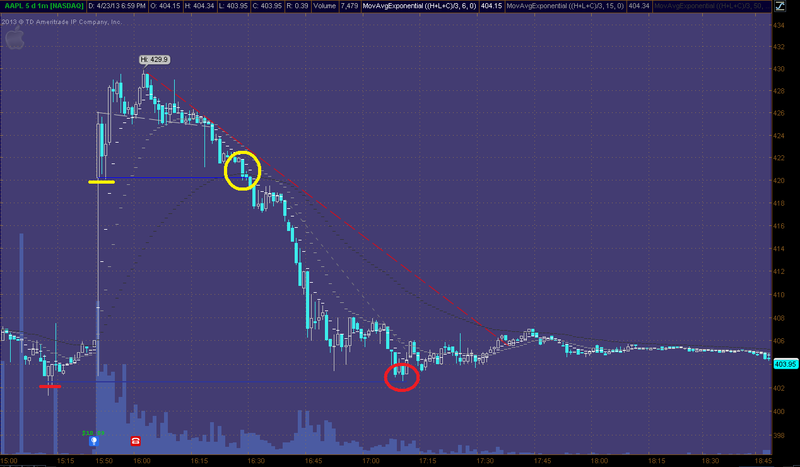 Even at its demise, the channel exerted an influence, repealing bulls twice -- notice the two topping tails within the yellow circle, each highlighted by a vertical red line. Then, just before bulls broke through the channel's upper boundary, price consolidated horizontally for a few candles just below the boundary line -- this price action is highlighted above by a horizontal red line. Again, why does this matter? Let's once more remember that the channel was well-defined in both life (when it modeled local maxima and minima almost to the tick) and death (when price action paused and briefly consolidated before breaking through). Given this, a high-probability trade idea was born on the bullish breakout from the channel: namely, to take a position in the direction of the breakout, with a well-defined stop-loss point on a reaction back into the channel. To be clear, this analysis says nothing about where the GCM3 contract will trade next week, or even tomorrow. A trade like this is just a test of a hypothesis: will the breakout hold or fail? There is no implicit judgment about where the security is ultimately headed or ought to be. MAR13. 17:37EST. VMware (VMW) today offered a profitable trade setup to market participants that remembered the shares' late-January collapse on a poorly-received earnings report. The setup in VMW was about as simple as they come: a break and (hourly candle) close above well-defined horizontal resistance. VMW (VMware). Fri, Jan 25, 2013 to Wed, Mar 13, 2013. 1-hour candles. On Tues, Jan 29, VMW gapped down from $98-and-change to under $80. The day's high tick was $80 even. Over the following fortnight, price consolidated horizontally, finding resistance on several occasions at approximately $79.6 -- this horizontal resistance is marked on the screenshot above by a solid blue line, with touches emphasized by yellow lines. Today, VMW finally pierced $80 on the day's first hourly candle, with the move coming on high volume and with a positive news catalyst. On today's second hourly candle, price closed above $80 and subsequently rallied as high as $82.82. To be sure, a trade hypothesis based primarily upon a break of horizontal resistance can be tricky. Such breaks sometimes fail, particularly when they occur on low volume and/or late in the trading day. Yet the VMW setup had several favorable characteristics: 1) the $79.6-$80 horizontal resistance level was very well-defined; it was initially established on a high volume gap down, and it was subsequently tested a few times; 2) price had consolidated for a few weeks; and 3) the breakout occurred on very high volume and early in the trading session. Another advantage with breakout trades: a clear trade hypothesis (price must stay above the breakout, potentially allowing for short-lived "chop"), which by extension leads to clear stop-loss criteria. JAN30 2359EST. Kai Ryssdal of Marketplace, the National Public Radio business news show, mentioned the yield on the 10-year Treasury Bond during today's show -- an atypical statistic for that particular program, and anecdotal evidence that bonds' recent slide may be overdone, at least temporarily, given that coverage of the rising yield is reaching more mainstream media. One way to monitor long-dated US government bonds is with the TLT exchange-traded fund, which tracks the performance of Treasuries with 20 year or longer maturities. A chart of price action since August 2011 shows that, earlier today, TLT reached the support line of a well-defined, 2.5-year price channel, shown in dashed red in the screenshot below. 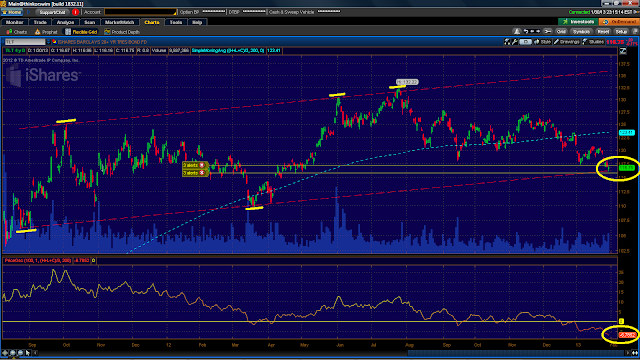 TLT (20+ year Treasuries ETF). Aug 2011 to Jan 2013. Daily candles. JAN29 0038EST. 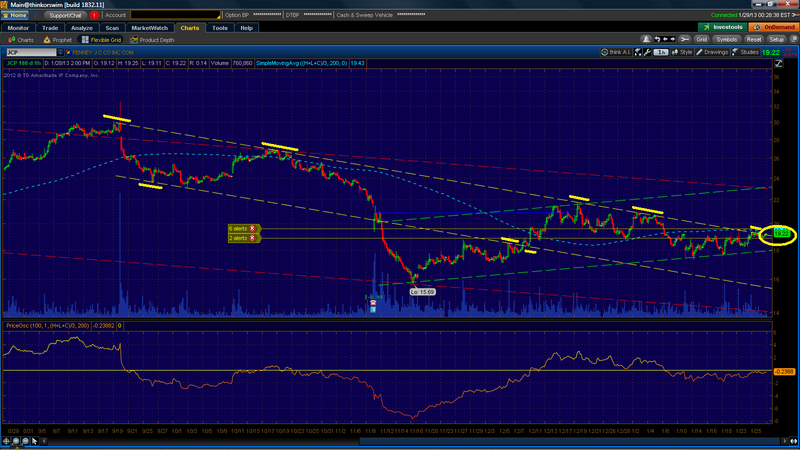 Shares in JC Penny (JCP) are peeking through the resistance of a 4-month trendline on the hourly-candles chart. The trendline is shown below as the upper line of the dashed yellow channel. JCP (JC Penny). Aug 28, 2012 to Jan 28, 2013. Hourly candles. JAN24 1930EST. S&P500 futures (front-month, e-mini Mar 2013 contract: ESH3) rallied this morning into resistance from a well-defined, 30-month price channel. Upon a relatively precise touch of this resistance at 1497.75, the futures contract and the overall market sold off in the late morning / early afternoon, forming a topping tail daily candle. The chart follows below. The channel in question reaches back to the lows of July 2010 and is marked on the chart as a yellow dashed line. Of note: the difference between price and the 200-period simple moving average, shown by the oscillator below the price graph, is elevated but not extreme -- buttressing the point that a market sell-off is not necessarily the inevitable outcome of the recent bullish price action. 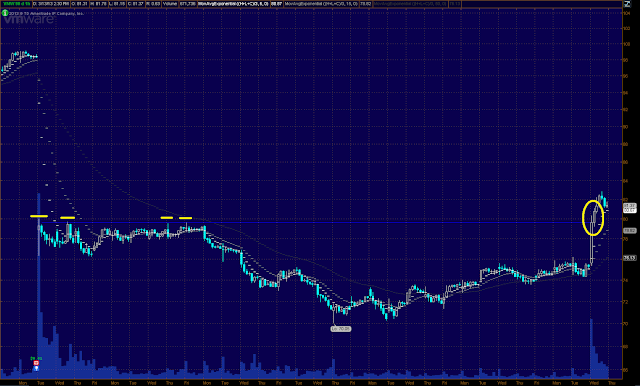 ES (E-mini S&P500 futures contract). April 2010 to January 2013. Daily candles. JAN24 1023EST. Among the many caution signals in the markets at present -- including a VIX reading not seen since May 2007, the financial futures and market indices at trendline resistance levels, the S&P500 in particular just now kissing round-number resistance of 1500, etc -- another chart now joins the Cassandra camp. That would be the 2-month perspective on SDS, a leveraged ETF that tracks the inverse of the S&P500. 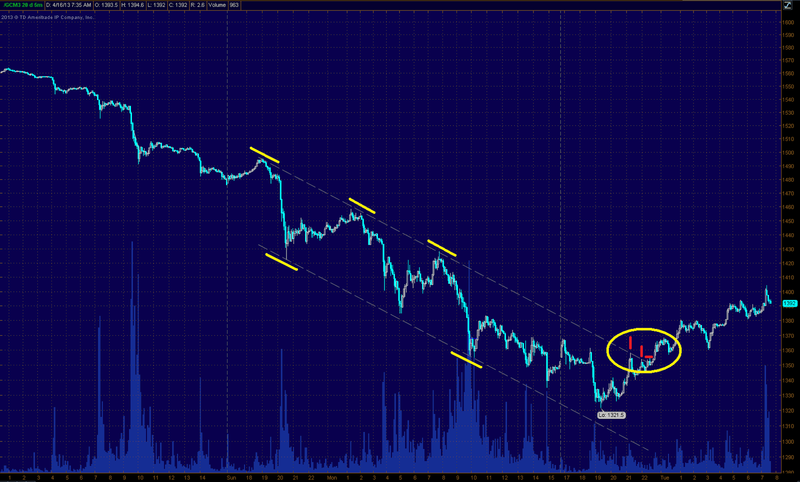 The chart, pasted below, shows that price is at the support line of a well-defined, 2-month channel. Since SDS, the Proshares Ultrashort S&P500, moves inversely to the indices, the security's touch of support suggests that the broad markets are at resistance. SDS (Proshares Ultrashort S&P500). Nov 12, 2012 to Jan 24, 2013. 1-hour candles. Moreover, the oscillator at the chart's bottom also paints a bearish picture. That oscillator, which measures the difference between price and the 200-period simple moving average, is presently at a 2-month low, which indicates an oversold market for SDS. Of course, markets can grind on higher still -- such is the nature of bull markets -- and the nimble trader would be well-served by continuing to place bullish bets until they actually stop paying off. Nonetheless, the caution signals merit discussion, even if the initiation of bearish strategies still remains premature. JAN16 1337EST. 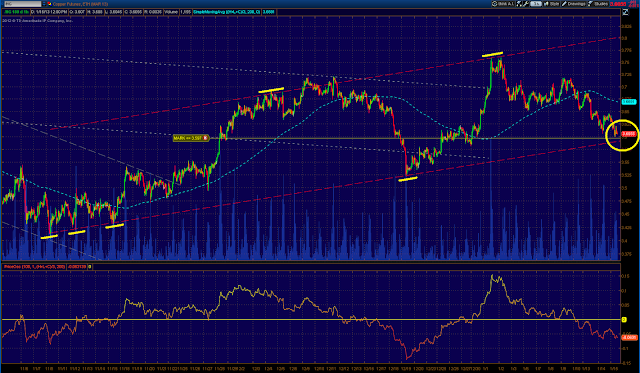 Copper futures (front-month Mar 2013 contract: HGH3) are approaching support from a two-month price channel. If the channel's lower support line is reached in the next few hours, support might be expected at a price of about $3.5925. A 2.5-month chart follows just below; the channel in question is shown in dashed red. The lower, support line of the channel is well-defined, perfectly touching local minima in mid-November and on Dec 19 -- in some cases, vis-a-vis candle bodies, in other cases, candle tails. Admittedly, the upper line of the channel is not robustly defined; the line touches local highs on Dec 4/5 and Jan 1/2, but is breached by spikes on Dec 9 and Dec 11. HG (Copper futures). Nov 4, 2012 to Jan 16, 2013. 1-hour candles.